The Riken research institute (abreviation of Rikagaku Kenkyūjo, 理化学研究所, meaning Physico-Chemical Research Institute) and the Riken foundation exist since 1917. In 1927 was created the Rikagaku Kōgyō K.K. (理化学興業㈱, meaning Physico-Chemical Development Co., Ltd.) to market products derived from the research of the institute. On Feb. 6, 1936, the photographic paper division became Riken Kankōshi K.K. (理研感光紙㈱, meaning Riken Sensitized Paper Co Ltd) and was placed under the responsibility of Ichimura Kiyoshi (市村清), who is thus considered as the founder of today's Ricoh. The factory was located in Ōji (王子), Tokyo. In 1937, Riken Kankōshi bought the company Asahi Bussan and its associated manufacturing facility, producer of the Olympic and Super Olympic cameras. This company had started the distribution of Olympic cameras in 1934 and released the Super Olympic in 1935 or 1936. In November, Riken reorganized these into the dependent company Asahi Kōgaku Kōgyō (unrelated to the other Asahi Kōgaku predecessor of Pentax), which would continue the production of bakelite cameras and leaf shutters in a semi-independent way. In March 1938, Riken Kankōshi itself became Riken Kōgaku Kōgyō K.K. (理研光学工業㈱, meaning Riken Optical Industries Co., Ltd.). The same year, it announced the Riken No.1, a 3×4cm camera with focal-plane shutter, which was actually released in 1939 as the Gokoku. The camera was produced in the Ōji plant, and was followed by the Ricohl, Roico, Ricohflex B, Gaica or Kinsi before the production was ended by the war. In parallel, Riken Kōgaku Kōgyō gradually took over the distribution of the cameras made by Asahi Kōgaku Kōgyō. The Olympic Camera Club established by Asahi was turned into the Ricoh Camera Club (理光カメラクラブ), and its magazine Shinkō Graph (新光グラフ) was taken over by the parent company. Riken also sold cameras made by various subcontractors, whose identity is not always known. The subcontracted models were sold with lenses and shutters made by Riken, but the degree of involvement of the company in the assembly of these cameras is unknown. Riken sold a few lenses to other manufacturers as well. In 1941, the subsidiary Asahi Kōgaku Kōgyō became Asahi Musen Kōgyō K.K. (旭無線工業㈱, meaning Asahi Wireless Co., Ltd.). Its factory was in Magome, Tokyo, at the location of Ricoh's current headquarters. In addition to cameras and optical products, it was making wireless equipment. In 1942, the two companies Riken Kōgaku Kōgyō and Asahi Musen Kōgyō left the Riken Foundation which was the last link remaining between the Riken Institute and its offshoot companies. The production and sales of cameras was stopped during the war, perhaps around 1942 or 1943. Part of the optical division was transferred to Asahi Musen at the time, apparently including the camera department, to preserve the know-how. After the war, the subsidiary Asahi Musen introduced the Steky in 1947. Asahi Musen soon became Asahi Seimitsu Kōgyō (旭精密工業, meaning Asahi Precision Industries), which was in charge of all the camera development and manufacture in the late 1940s and early 1950s, in the Magome plant. The main designer was Fujimoto Sakae, who previously worked for another major camera maker, and who made efforts to prepare the factory for mass production. Work on an improved version of the wartime Ricohflex B TLR camera started immediately after the war, and the resulting Ricohflex III was launched in 1950. It was the first of various geared-lens Ricohflex models, which met a large success on the domestic and export markets, and initiated the 1950s "TLR boom" in Japan. 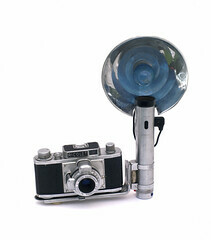 The company made almost no attempt to produce bellows camera, except for the Ricoh Six in 1952. The subsidiary Asahi Seimitsu was merged into Riken Kōgaku Kōgyō in April 1953, and all subsequent camera activity took place in the main company. The first 35mm camera was the Ricolet, released the same year, followed by various viewfinder and rangefinder cameras. The Ricoh Auto Half half-frame camera with spring motor, released in 1962, was another commercial success, made in various versions until the early 1980s. The company finally took the name of its products, becoming Ricoh (K.K. Rikō, ㈱リコー) in 1963. From 1964, it made a few 35mm SLR with interchangeable 42mm screw lenses, most of which were called Singlex. In 1977, it switched to the K mount introduced by Pentax, for a series of cameras called XR, made until the 1990s. The only autofocus SLR cameras made by the company were the various Mirai, with non-interchangeable zoom lenses. In 1994, Ricoh released the Ricoh R1, a compact camera with panorama mode. It was followed by various other deluxe compact cameras, such as the GR1, and the company continued this trend into the digital era with the GR Digital. In 2009, Ricoh released the Ricoh GXR, an interchangeable lens camera without bayonet. The GXR is an interchangeable unit camera system in which lenses are changed by using a slide-in mount system to attach camera units to the body. The lens, image sensor, and image processing engine are integrated into the camera units so the body itself does not contain an image sensor. In 2011, Ricoh acquire PENTAX Imaging Systems Business. Riken Ultrazin or Luminous filters were made by a different company called Riken Ultrazin Kōgyōsho (理研ウルトラジン光業所), then Riken Kōki (理研光器). ↑ 1.0 1.1 History page of the official website of the Riken Institute. ↑ 2.00 2.01 2.02 2.03 2.04 2.05 2.06 2.07 2.08 2.09 2.10 2.11 Arimura, p.6 of Kurashikku Kamera Senka no.14. ↑ 3.0 3.1 Matsuzawa, history of Riken Kankōshi, in the June 2000 issue (no.228) of the Riken News bulletin. ↑ 4.0 4.1 History page of the Ricoh official website, 1936–45 period. ↑ The exact address in 1943 was Tōkyō-to Ōji-ku Kamiya-chō 1–760 (東京都王子区神谷町1–760). Source: "Kokusan shashinki no genjōchōsa" ("Inquiry into Japanese cameras"). ↑ Article of IR Magazine about the history of Ricoh. ↑ Comparison of the August 1938 and November 1940 issues of Shinkō Graph. The club is called Olympic Camera Club in the former and Ricoh Camera Club in the latter. ↑ Arimura, p.6 of Kurashikku Kamera Senka no.14. This source gives the name "Asahi Musen K.K." but the full name is given by the April 1943 governement inquiry and by Matsuzawa in this article of the Riken News bulletin. ↑ Arimura, p.6 of Kurashikku Kamera Senka no.14. The address in 1943 was Tōkyō-to Ōmori-ku Magome-chō Nishi (東京都大森区馬込町西) 4–3085. Source: "Kokusan shashinki no genjōchōsa" ("Inquiry into Japanese cameras"). ↑ Arimura, p.6 of Kurashikku Kamera Senka no.14, says that camera production was prohibited in July 1941, but that general prohibition was not applied instantly by all manufacturers. Sales of Riken cameras continued for one year or two, as demonstrated by advertisements dated 1942 and 1943 listed in Kokusan kamera no rekishi (the last ones are those for the Ricohl IIB). ↑ Company names: chronology of the Riken Konzern. Attribution of the Luminous filters to Riken Kōki: leaflet or instruction manual observed in an online auction. ↑ "Kokusan shashinki no genjōchōsa" ("Inquiry into Japanese cameras") (lens item Lc12). ↑ "Kokusan shashinki no genjōchōsa" ("Inquiry into Japanese cameras") (lens item Lb37). The British Journal Photographic Almanac 1938, edited by Arthur J. Dalladay. London: Henri Greenwood & Co., Ltd. Publication date not indicated, certainly late 1937. Advertisement by Asahi Bussan on pp.694–5.